This post is exclusively for Blog Hop Wednesday. Blog Hop Wednesday is a brand new exciting event started by Radhika of Tickling Palettes. The concept behind this event is visting our fellow bloggers and trying out new recipes every week. Radhika has moulded this event in a special manner like forming groups, and each week we choose one of the blogger to try out new recipes. Hope you got it, if not that's ok, once you start following it, you'll surely get it. If you are a blogger just jump into the blog hopping with us and have fun. At this point we have a bunch of wonderful bloggers and this week I have got Divya of Easy Cooking to cook from. I know you don't need any introduction for Divya's Easy Cooking. She is very popular with all her baked goodies and offcourse other recipes too. I was so excited when I got Divya's blog for this week, I went through her blog so many times and a lot of recipes caught my eyes, she is such a wonderful blogger. Finally I ended up in this aviyal from her blog. 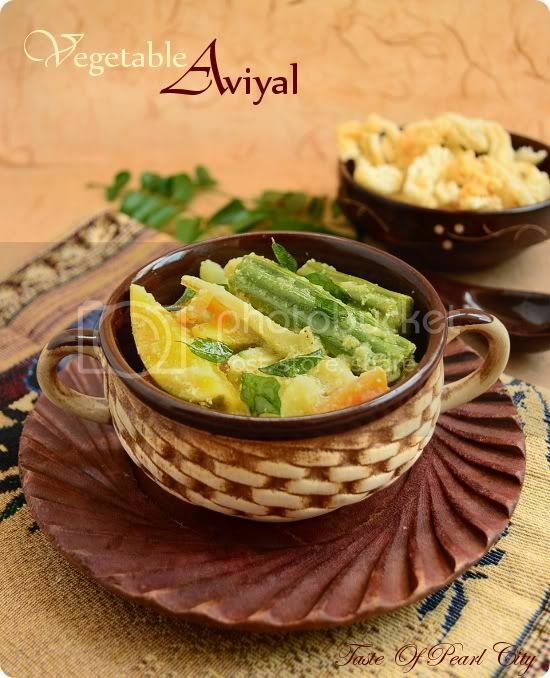 Aviyal is nothing but a mix of vegetables cooked in mild coconut based sauce, a traditional recipe from Kerala . To be honest as a kid I used to hate this aviyal with all the vegetables in it, I used to pick only the raw mangoes and leave the rest in the plate. It's just gone the opposite now, I'm loving this aviyal a lot now. Do try this recipe, I'm sure you'll enjoy it, also don't forget to check our Blog Hop every alternative weeks. Wash and slice all the vegetables lenghtways. For raw banana, carrot, potato and drumstick peel them before slicing it. Heat oil in a kadai or pan. Add all the washed and chopped vegetables , except raw mango. Stir well to coat in oil. Cover the pan and let it cook for 3 to 4 minutes. Meanwhile grind together coconut, turmeric and cumin seeds into coarse paste. Add the ground mixture along with green chillies, raw mango and salt to the vegetable mixture. Add enough water to cover the vegetables. Cover the pan with a lid and cook until the vegetables are soft enough. Finally heat oil in a separate kadai, add the curry leaves, stir for 1 minute. Pour the hot oil on top of the cooked aviyal. This Aviyal goes well with plain rice with a combination of Spicy fish gravy and poppadums. Instead of coconut oil you can also use sunflower oil or any other oil of your choice, but coconut oil gives a special touch to this aviyal. This recipe is linked with Blog Hop Wednesdays. Love the authentic Avial..but no one at home likes it and so it is kind of a forgotten recipes for me!! Sooperb clicks, love the mat and the cup n plates..everything aptly matched ..Looove this aviyal..Wish I've some to relish eating ..
My fav any time...looks perfectly done yummm! Stunning click dear!! Love to grab whole cup dear..
had this at a friend's place and totally loved it. very light yet flavourful and delicious. Yum Avial.. and superb pics :-) Happy to do the Blog hop with you, and following you now ! Thanks for trying out Aviyal!You've made it look so pretty! delicious aviyal..please join us in Celebrate Sweets - Sweet buns event . The click is making me so hungry. The cutlery is so beautiful too. the pics are fabulous! love the new look to ur blog as well.. I love to have aviyal with sambar.. Wonderful clicks..
And btw....welcome to blog hop!!! Ha this is my fav recipe and will be too good if we have with adai.Feeling like having a mouth. Mixed vegetable aviyal looks so tempting..
Looks Delicious. Nice clicks as well. Wonderful pics Ayeesha.. Mouth watering.. !! aviyal looks wonderful !! superb recipe !! Avial is so delicious and tempting and so colorful, awesome presentation dear!! hi, very nice pictures. Sure this dish taste just as delicious as the picture looks. Happy blog hop! Aviyal makes me hungry, seriously drooling over that colourful aviyal..
Looks and sounds delicious! Love the flavorful combinations of the coconut and spices- yum! Looks very healthy and tasty. Thanks for sharing. Lovely looking avial. Great preparation. Totally love your table setting..
hahaha i used to hate vegetables too. this looks fantastic! avial looking perfect n very tempting...very nice !!! Our good old Aviyal looks so tempting. The picture is making me hungry ayeesha. Love them absolutely. Nice presentation. Looks very tempting. I like the idea of exchanging recipe...this is exciting. I love the photo of this recipe...I usually cooked vegetable in coconut cream with prawns. I would love to try this. Ayeesha it's so beautifully presented - makes me wanna grab that bowl with a plate of steaming hot rice ! Absolutely fab picture. Avial must have tasted great. Even i never liked it when i was a kid, i would somehow try to place it on somebody else plate when they don't notice :) Your aviyal is so much tempting dear. Amazing pics. This sounds like a really fun event and a great way to discover new blogs! Aviyal looks very tasty and has pretty colours! You picked a perfect recipe. Wow, it's gorgeous. I love the bowl and plate you have. What is the drumstick? I've never heard of that. I love aviyal and what makes it more appealing is the way you have presented- Simply superb! I love aviyal so much that I can have it on its own..Your aviyal is making me hungry...wonderful clicks too..nicely presented. The recipe sounds delicious! Unfortunately I am not able to view the photos. The raw banana must give a unique flavor to this dish. Woow, this is so tempting, looks fantastic! I like authentic food never make before Avial must try. I've never had this before but it looks fabulous and I am bookmarking to try later! A classic so beautifully presented ~ awesome!! 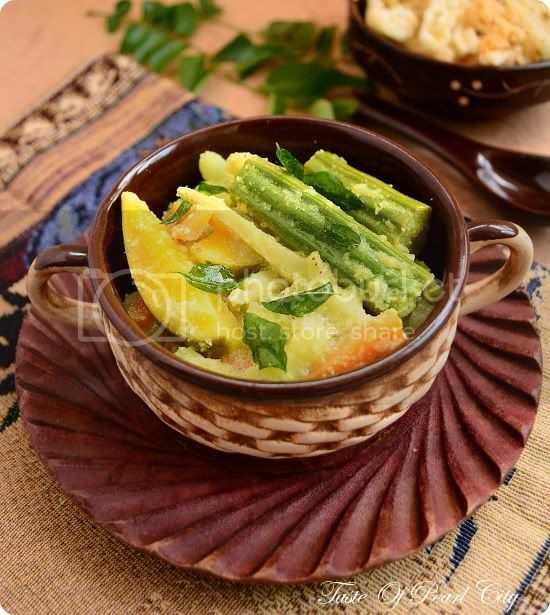 Avial is one of my favorite veggie dishes and I love how you have captured it with your lenses. Lovely colors and great props--well done, Ayeesha, as usual! love your stunning pictures, and I have never had aviyal all my life, i must have missed out on good things..need to compensate for it now! Ohh.. 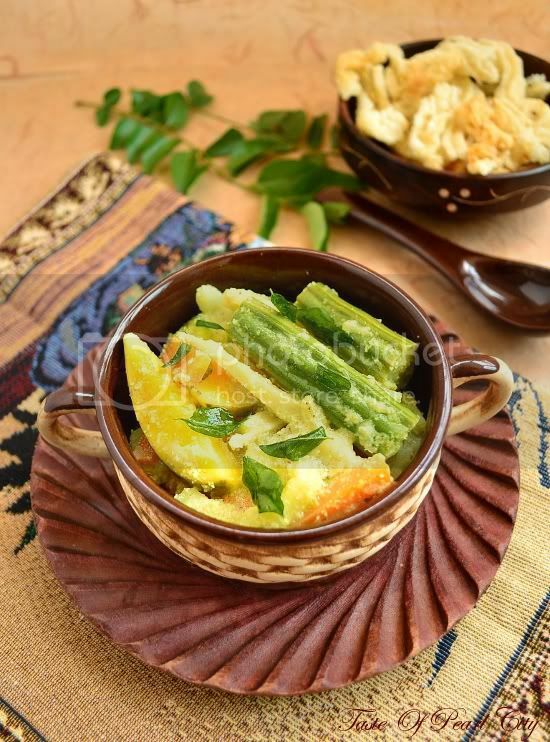 I love the serving dish.. beautifully pictured..
Aviyal is such a comfort food for me.. would just be perfect with idiyappam..
such a stunning dish, I bet I could eat it all!! thanks for sharing! !